And if not a political solution would be on sight, according to Bildt, what kind of solution he and his mentors at NATO have in mind? Nearly every day the Swedish news brings reportages on Russia, invariably ‘exposures’ in negative or detrimental terms for both the Russian society and their leaders. For instance, some days ago on occasion of the World AIDS Day (1 Dec), the Swedish TV had nothing to say about the situation of the disease in Africa or other countries ferociously targeted. Not at all. Nothing, or almost nothing, about the current epidemiological panorama in Sweden. Instead, the Swedish ‘public service’ TV spent all the reportage to describe the situation of the disease – and the alleged shortcomings of its treatment – in Russia! In September 2014, a new government was formed in Sweden, based in the victorious Centre-Left coalition. Hence, a new minister of foreign affairs was appointed, Ms. Margot Wallström. However, for the US-culturally dependent and pro far-right Swedish TV, the politician to interview to analyse the geopolitical situation around Ukraine or Russia is not the actual foreign minister of Sweden. 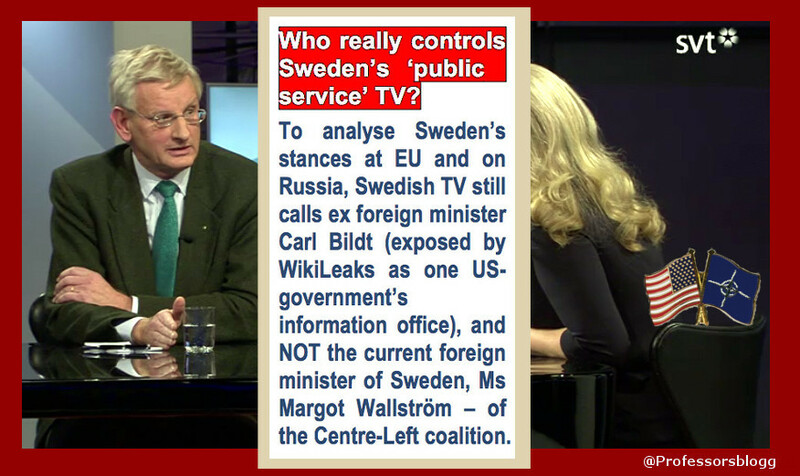 Instead, they call Carl Bildt –the man exposed by WikiLeaks of being Information officer of the U.S. government. Today (7 Dec 2014) it was the turn of the main in-depth news analysis at the Swedish ‘public service’ TV, the Sunday program Agenda, at Channel 2. Earlier in the day they had announced the participation of Carl Bildt in an analysis of the future of the EU sanctions against Russia. Here below I publish transcriptions of some quite revealing passages of the Bildt’s interview. The interview can be watched online here (at position 37:15). The stances of the former FM Carl Bildt on Ukraine and Russia has been widely analysed in the Professors’ Blog. 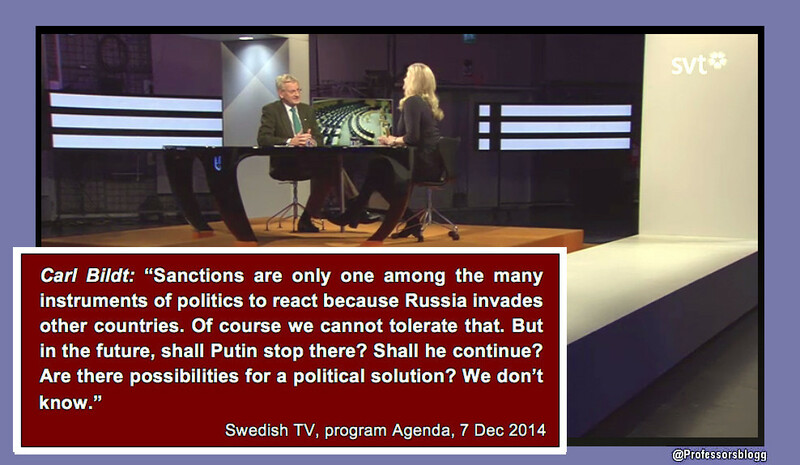 See for instance, Swedish Television’s Russophobic support of fascist cause in East Ukraine continues unabated. 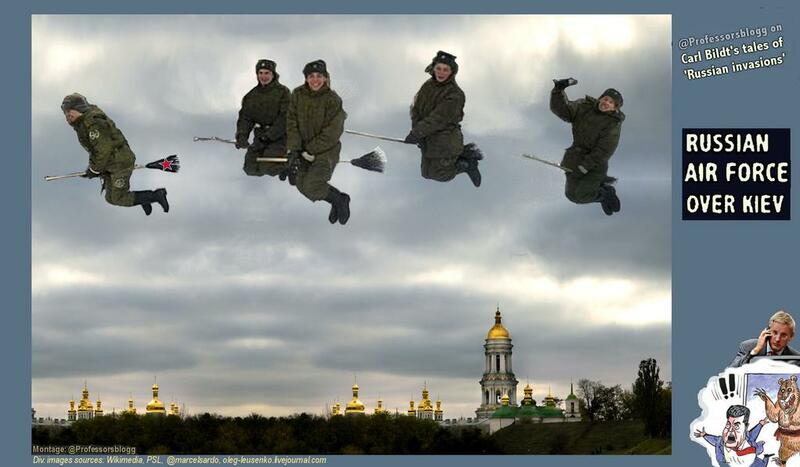 Carl Bildt’s heritage?, Are corporations linked to weapon-export industry behind ‘individual countries’ US & Sweden, instigating war in Ukraine?, Foreign Minister Carl Bildt: “Of course Russian separatists downed Malaysian MH-17″. Swedish media not asked him on what evidence, The soon former Swedish Foreign Minister Carl Bildt commented the Odessa massacre and the use of force against “separatists” in Ukraine, A Swedish Extremist Right Wing “Diplomacy”? Or Bildt’s Solo Support To Ukraine Nationalists? Swe TV: Have they succeeded with that? Swe TV: How active is Angela Merkel in moving forward the sanctions-policy? CB: Considered the general political situation she is one of the most important, or perhaps the most important singular gestalt. If we consider Russia’s efforts of divide EU, of divide different European countries, then is Germany the most important single country. Angela Markel has there a very strong position. She has also the capacity of talking med Putin in his own language. Swe TV: She (Angela Merkel) has sharpened her tune also, lately . . .
Swe TV: There are, however, social democratic leaders that have expressed their understanding . . .
Swe TV: Nevertheless, does the risk exist that this sanctions-policy against Russia makes Putin strained, and becomes unpredictable, and DANGEROUS? ← Is Swedish ‘Public Service’ TV, Neo-Fascism’s Megaphone? Yes, that Carl Bildt works for the White House is pretty evident to me and has been a long time. I dare say I’m not alone. Sweden has a unique tradition of a central government, in one form or the other, bullying the Swedish people for some 500 years without interruption. The bullying is now polished and very subtle. That’s why the exposure of Carl Bildt in Swedish main stream media doesn’t stir up any reaction. This local government supremacy is now cracking up. Swedes know the facts, but have not yet figured out what to do about them. So, now that the cracks are getting wider, will the light shine in?